Survey respondents were asked to report their compensation for patient care. For employed physicians, that includes salary, bonus, and profit-sharing contributions. For partners, it includes earnings after taxes and deductible business expenses before income taxes. Only full-time salaries are included in our results. Physician income has done quite well since our 2015 report, in which primary care physicians earned an average of $195,000 and specialists earned an average of $284,000. The 2019 figures represent increases of 21.5% and 20%, respectively. Physician overall average salary for 2019 was $313,000. Orthopedics and cardiology have been among the five top-earning specialties in our report every year for the past 5 years. Pediatrics, family medicine, and diabetes and endocrinology have been among the lowest. As in prior years, male physicians earned more than female physicians. In this year's report, they earned 25% more. In 2018 it was 18% more, 16% more in 2017, and 17% more in 2016. The figures reported are based on full-time salaries. Increasingly, more organizations, such as the Time's Up Foundation, are working to tackle gender pay disparity in healthcare. The overall salary difference between men and women in specialties remains high. This year, male specialists earned 33% more. Last year, they earned 36% more. With the exception of ob/gyn, women often choose to practice one of the lower-paying specialties. For example, women make up less than a fifth each of orthopedists, plastic surgeons, urologists, and cardiologists, which are among the highest-paid specialists. However, the preponderance of women in the lower-paying specialties doesn't explain the pay disparity within each specialty. In primary care, men spent 9% more time with patients than did women (amounting to an additional 4 hours per week). "We have found that the vast majority of the difference in hours spent seeing patients is driven by physicians themselves," says Travis Singleton, senior vice president of Merritt Hawkins, a physician search/recruiting firm. "Of the many physicians we work with who tell us what's important to them in a job, more women physicians say it's quality of life and flexibility with their schedule. Men more often say income and control over certain aspects of their practice." "Quality of life" doesn't necessarily mean taking care of children; it could include travel, exercise, or just more free time, says Singleton. As with primary care physicians, male specialists report seeing patients for about 3 hours per week (9%) more than their female peers. "The relationship between how many hours a physician sees patients and how much money they earn depends greatly on their practice arrangement," says Greg A. Hood, MD, a self-employed internist in Lexington, Kentucky, and a frequent Medscape contributor. "In a private practice, once you cover your overhead, you keep everything above that. So for someone who works an extra 3 hours a week seeing patients, the income from those 3 hours could be almost pure profit." However, the situation is somewhat different for employed physicians. There's been a startling increase in paperwork and administrative tasks over recent years. In 2012, the majority of physicians (53%) had about 1-4 hours of paperwork per week, with another 13% clocking in 5-9 hours. In this year's report, the majority of physicians (74%) cite over 10 hours per week, and of those, more than a third have over 20 hours. While men spend more hours seeing patients, women may spend very slightly more time per week on paperwork and administrative work. As in prior years, Caucasian/white physicians earn more than physicians of other races. In 2019, Caucasian/white persons represent the highest percentage of physicians in specialties (75%) and the lowest percentage in primary care (25%). However, the racial pay disparity within specialties is still present. Self-employed physicians continue to earn more than employed physicians. To some degree, this may correlate with age: 64% of self-employed physicians are over age 50 versus only 46% of employed physicians. According to the Medscape Residents Salary & Debt Report 2018, only 21% of residents anticipate becoming a practice owner or partner, although another 20% said they may want to do so. Keeping overhead low plays a key role in determining how profitable the practice is. "Overhead varies tremendously between specialists and primary care physicians, with PCPs' being higher, as they require more operating resources and typically see more patients," says Judy Capko, a medical practice management consultant with Capko & Morgan, based in San Francisco. "There is a broad variance between specialties, and other variables include demographics, urban versus rural, size of practice, and number of sites. As far as a benchmark, a low [percentage] would be in the low 40s, but considering all of these different factors, it could be substantially higher." Two of the 10 top-earning states are new to our list: Tennessee and Georgia. The other eight appeared on last year's list. More than half of the office-based solo practices (55%), office-based single-specialty groups (56%), and office-based multispecialty groups (51%) who use NPs and PAs said that these clinicians helped increase profitability. Salary is not necessarily the leading factor in feeling fairly compensated. 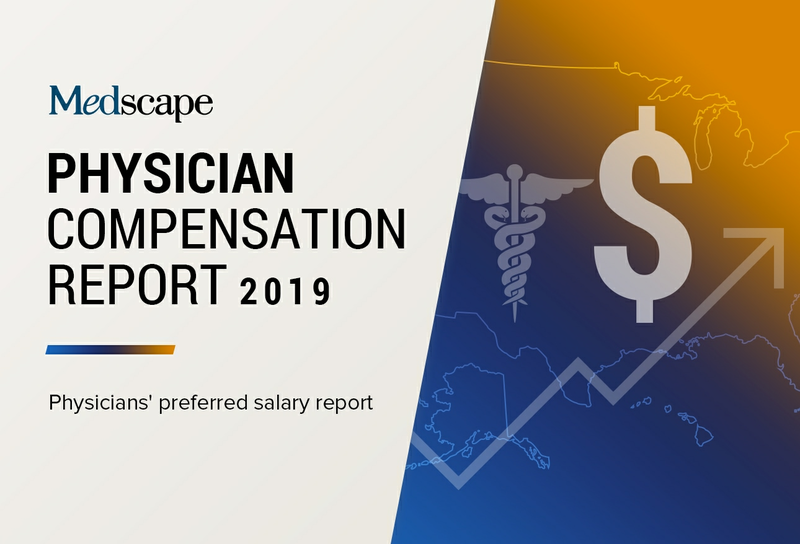 Some of the higher-earning specialties, such as orthopedics and plastic surgery, report somewhat lower levels of satisfaction with compensation. For the sixth year in a row, dermatology is among the top-ranking specialties regarding satisfaction with compensation. Even though they may be dealing with burnout and frustration, physicians work hard to do a good job. Over 90% are either satisfied or very satisfied with their own job performance. "Doctors take great pride in what they do, even under difficult circumstances, and I would imagine that we all feel we do the best we can in spite of the challenges," says Carol Bernstein, MD, psychiatrist at NYU Langone Medical Center. "In addition, we would like to think of medicine as a 'higher calling'; a sense of altruism and higher purpose may help us do the best we can, despite burnout." A large percentage of physicians either already participate in MIPS (Merit-based Incentive Payment System) or are planning to—far more than those citing APMs (alternative payment models), which are more appropriate for very large practices and hospitals. CMS has been working to make the requirements for participating in MIPS less burdensome, in hopes of getting more physicians to join. About a fifth of respondents said they would drop insurers that pay poorly. This is in line with results in all prior years' reports, with a high of 25% in 2014. Having so many rules and regulations was the leading challenge for physicians this year (26%) and last year (27%). In 2018, physicians (16%) found it challenging that they had to work longer hours. Worrying about getting sued is not often mentioned as a top challenge; only 8% selected that in both 2017 and 2019. The most rewarding part of many physicians' jobs is gratitude from and relationships with patients. After all, one of the motivations for becoming a physician is to help people. Many doctors also take much pride in what they do and feel that they are making the world a better place. The majority of physicians would choose medicine again as their career. Among the highest percentages were those in infectious diseases which, notably, is among this year's lowest-paid specialties. For many if not most physicians, the career holds rewards beyond financial. Of those who would choose medicine again, a majority of physicians in each specialty said they would choose their specialty again. In fact, for almost a third of the specialties, more than 90% said they would choose that specialty again. Among family physicians and internists, about a third of each would go into a different specialty.